Welcome to Kenwood Lutheran Church' s website. Hello! 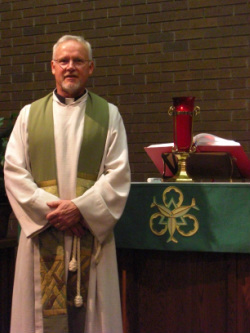 My name is Jeff Holter and I am the pastor at Kenwood Lutheran Church. Kenwood is a wonderful place to grow in the grace of God and to experience the love of God in Christ Jesus our Lord. We are excited that you have come to share this time with us and would love to discover if there might be new ways that we could grow in a deeper fellowship and relationship with Jesus. As the pastor, I know that we are always striving to seek new opportunities to reach out to all of God’s children. It truly is our desire to make all of God’s family feel welcomed and accepted. Thank you for being here and for giving us a vision of Christ in your smile, in your voice, and through your life. Our mission, “Built on a rock, with Christ as our center, we serve the community and beyond” is an invitation. I hope and pray that it includes you. Could Kenwood be in your future? There are many opportunities at Kenwood. It is an exciting time to be the church, “the body of Christ”. You may find areas for personal growth and places where your talents for serving can best be used. We have fellowship through worship, music, crafts, quilting; well, the list is just endless! Perhaps you see a new ministry that will help Kenwood reach out to others in our community. One thing is clear though, God calls all of us into this incredible Christian life, marked by the cross and lived out in baptismal grace and faith. To this calling we are looking forward to getting to know you better and to become partners with you on our journey in serving God and the gospel of Jesus Christ.